Between 2011 and 2017 Romania managed to obtain 36.2 billion euros in funding, of which 15% was obtained by county and local authorities, according to ErdélyStat. Transylvania-based authorities were the most successful in obtaining funding for their projects: they obtained 2.4 billion of the total of 5.4 billion granted to local authorities, which compares to Moldova’s 1.7 billion and Țara Românească’s 1.9 billion euros. EU funds accounted for 6.4% of the local authorities’ total revenue, on average, during the period analyzed by ErdélyStat. Of the total amount of EU funds granted to Romanian local authorities, 50% went to rural settlements, while municipalities accounted for 29%, and the remaining percentage was granted to county councils. The biggest winners of EU funds were the Partium and Southern Transylvania areas. When dividing the winners into counties/cities and communities, the highest revenue went to county and city councils in Southern Transylvania, while the most successful communities were those from the Partium region. 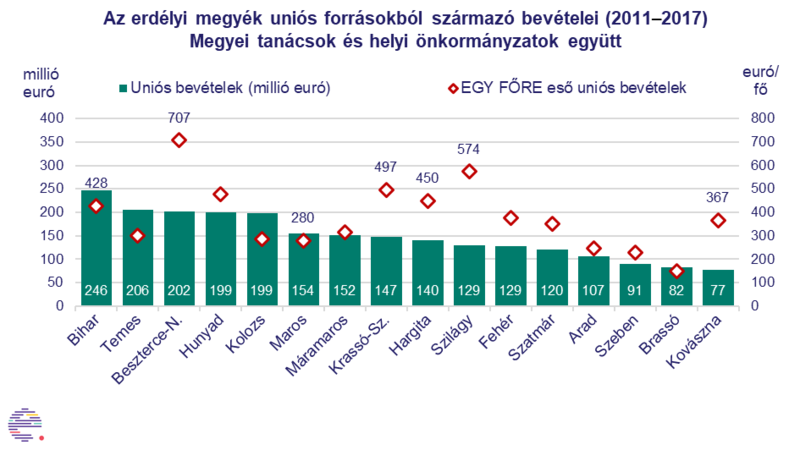 The best way to gain a complete picture of the overall success in obtaining EU funds is to have a look at the revenue per capita, according to ErdélyStat. Using this metric Transylvania is 30% above the country’s average (286 euros per capita) with 350 euros, surpassing Moldova, which matches the average, and Țara Românească, a region that recorded revenue lower than 286 euros per capita between 2011–2017. The region with the most successful applications was northern Transylvania with 463 euros per capita, followed by Partium (433 euros) and Szeklerland (417 euros), surpassing the Transylvanian average. 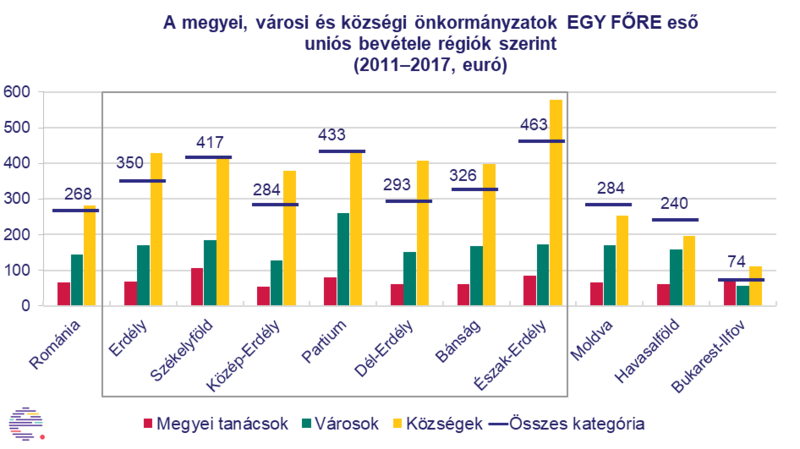 Among major Romanian cities, Nagyvárad/Oradea, Iași and Temesvár/Timișoara received the most in EU funding of 97, 79 and 72 million, respectively,outpacing the capital, Bucharest.